Multiple Nvidia GTX 1660 Ti graphics cards have been spotted on Russian retailers’ websites. Not only that, but TU116 support has been spotted in AIDA64, with both rumours coalescing to reaffirm that Nvidia’s oddly-named mainstream graphics card is gearing up for launch very soon. 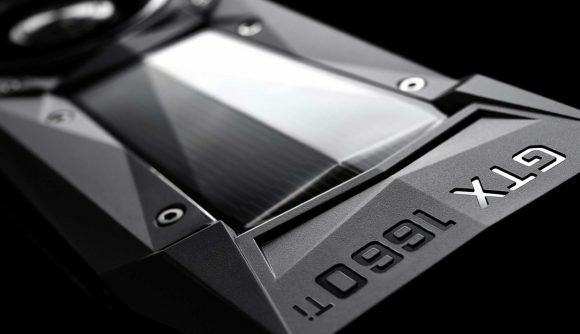 Four GTX 1660 Ti’s were uncovered across three online retailers: two MSI cards, the Gaming X and Armor OC; and two Palit cards, the StormX and StormX OC. If these leaks ring true, we can safely assume factory overclocked cards will be immediately out of the gate from Nvidia’s partners come release day. With a 1500MHz base clock and a 1,770MHz boost clock, the stock Palit GeForce GTX 1660 Ti StormX is clocked higher than its RTX 2060 brethren. Perhaps coincidentally the rated specs are similar to a factory overclocked GTX 1060. As for CUDA count, the GTX 1660 Ti bears no resemblance to the GTX 1060 or RTX 2060. These cards feature 1,280 and 1,920 cores respectively, while the 1660 Ti is slap bang in the middle with 1,536. One of the product pages (spotted by Videocardz) indicates the GTX 1660 Ti will be produced on the 12nm process node of RTX 20-series fame and will accompany 6GB of GDDR6 memory. The new spec memory is listed at just 12Gbps, a little shy of the 2060’s 14Gbps. In turn, this cuts memory bandwidth down to 288GB/s in tandem with the card’s listed 192-bit memory bus. Meanwhile, Guru3D spotted TU116 GPU support within the AIDA64 update release notes – ostensibly confirming the expected GPU codename. The grapevine currently has Nvidia’s GTX 1660 Ti set for an almost romantic post-Valentine’s Day launch on February 15. That’s awfully soon, and by no means guaranteed – as neither is the above – but if the veracity of these claims is ratified, we can expect the card to launch for $279, followed shortly after by the $229 GTX 1660.